Have you noticed that switching conventional foods with healthy replacements is back on the radar these days? It's always good to revamp your recipes and use new and exciting ingredients to improve them. In the spirit of the holidays and the healthy replacement trend, I'm covering an interesting topic for you today – the spaghetti squash. Whether you're a fan of the delightful squash (yeah, I've said it), or you're a complete stranger to the concept, I think I can provoke some interest in you. At first, there were spaghetti - long, silky-smooth, tasty, and enchanting. We all got hooked and enjoyed them in dozens of ways. This excellent pasta was (and still is) among the top three meals for everyone in the world; it was really that good. Then, the public got aware about the harmful effects of consuming (too much) spaghetti and classified it as a "bad" food. Then the revolution slowly started; it turned out there are ways to replace the spaghetti with healthy vegetables, and spaghetti squash is one of the best to replicate that taste and structure. 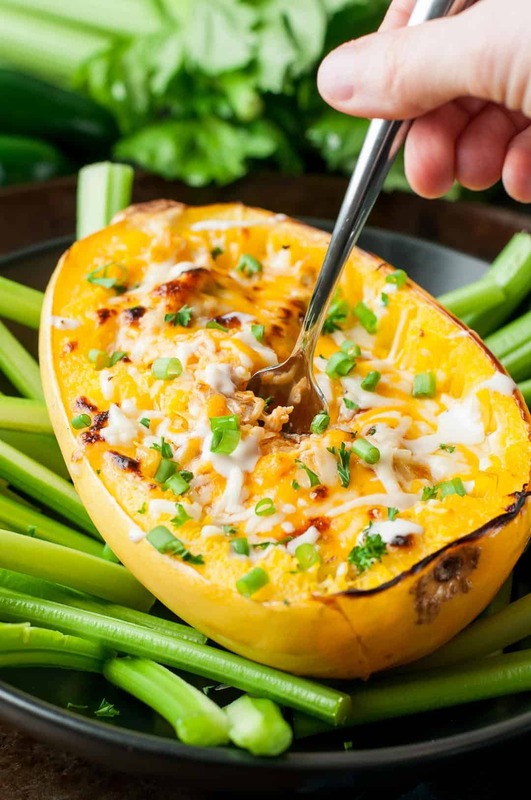 Today we're going all in on spaghetti squash; I'll teach you everything you could ever want to know about this healthy replacement and more. Get ready, you might even ditch regular spaghetti for good. 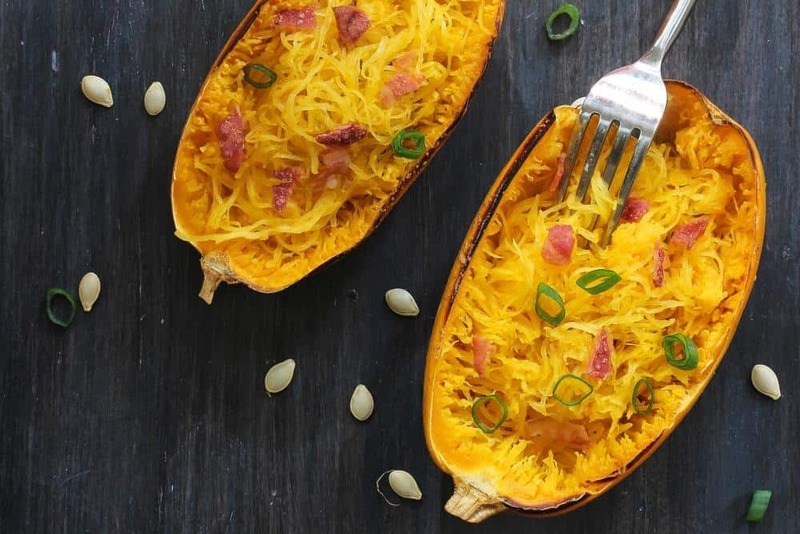 Does Spaghetti Squash Really Taste Like Spaghetti? 1. Spaghetti squash did not come out soft, but overly crunchy. 4. How can I make a spaghetti squash easier to cut? 5. Is it okay to reheat spaghetti squash? The guy (or woman) who found out that the inside "meat" of the squash forms into threads that look like spaghetti when processed by heat really had an epiphany - the squash spaghetti strands really resemble the popular pasta in looks. But, what about the taste? The regular spaghetti is familiar to everyone; the standard pasta taste that comes from starch and provides the soft sensation (or mild stiff one if cooked al dente) we're all used to. Depending on the way you make it, spaghetti (or any type of pasta) can taste sour, sweet, and salty. There are dozens of recipes online claiming that you'll have the perfect resemblance to the regular pasta if you cook it their way. The real truth is that no matter you how you cook it, spaghetti squash won't taste as regular spaghetti. It will be definitely close, by means of structure and looks, but the taste is different. Squash threads roll around the fork greatly and mix with the sauces superb, but their flavor is too mild compared to regular spaghetti. Therefore, it requires more spices than regular spaghetti to get the taste similarity. It tastes the best with heavy creams or used in stews and curry, because its taste won't alter the meal's overall taste, but will impact the structure and nutritional values significantly. Still tasty and healthier than regular ones. Amazing. There are a few different methods for preparing spaghetti squash; microwaving it, roasting it in the oven, and cooking it in a slow cooker. Each of these ways requires different tools, takes different amounts of time to prepare, and produces different results. Every way has its pros and cons, and it is up to you to choose which one suits you the best. Here are the detailed instructions for each method. Out of all three, this method is the quickest by far. It takes just over 10 minutes to prepare one-half of the squash and that time is hard to beat. The flavor is, according to many, not as good as the one you get in the oven, but I'll leave it for you to judge. Nevertheless, it is simple and convenient, so here is how to do it. Using a sharp and heavy knife, cut off the top and bottom of the squash. After that split the squash in half lengthwise. You should know that it is really hard to cut it so be careful and do it slowly. Next, scoop out all the seeds and innards using a spoon. When doing this, try not to dig in too deep, because we want to keep as much inner flesh as possible. Tip: Save the seeds for later and bake them. They make a delicious snack! Take the squash pieces and place them face down in a microwave-safe dish. If your dish can't fit both pieces at once, you can cook them one at a time, or refrigerate one-half and save it for later. Pour around 1 inch of water in the dish. The exact amount of water is not important; the squash only needs to be partially submerged because this will help to steam it more thoroughly. Check the squash by poking a fork into the skin. If the squash is ready, the fork will slide into it easily. 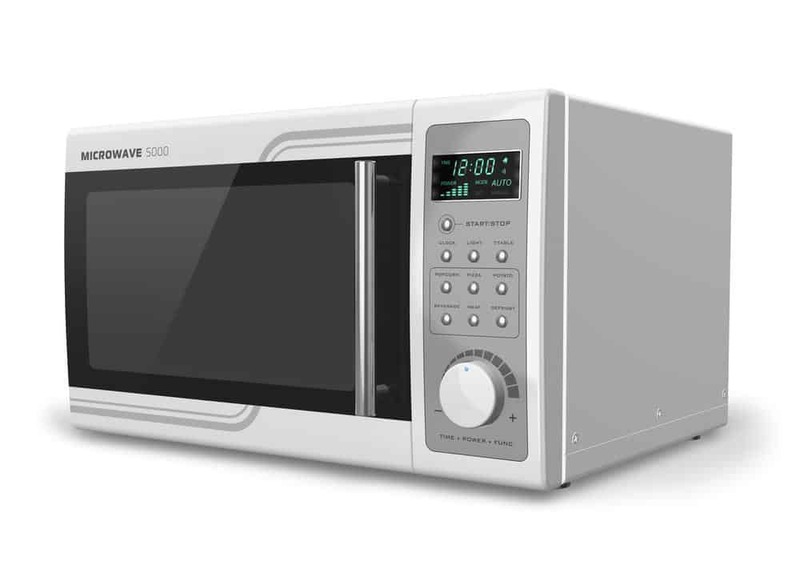 Microwave for another 2-3 minutes if needed. The cooking time will differ based on the size of the squash and the type of microwave, so make sure to keep checking every 2 minutes until it's done. Leave it to cool for around 10 minutes, and scrape out the spaghetti-shaped strands with a fork. 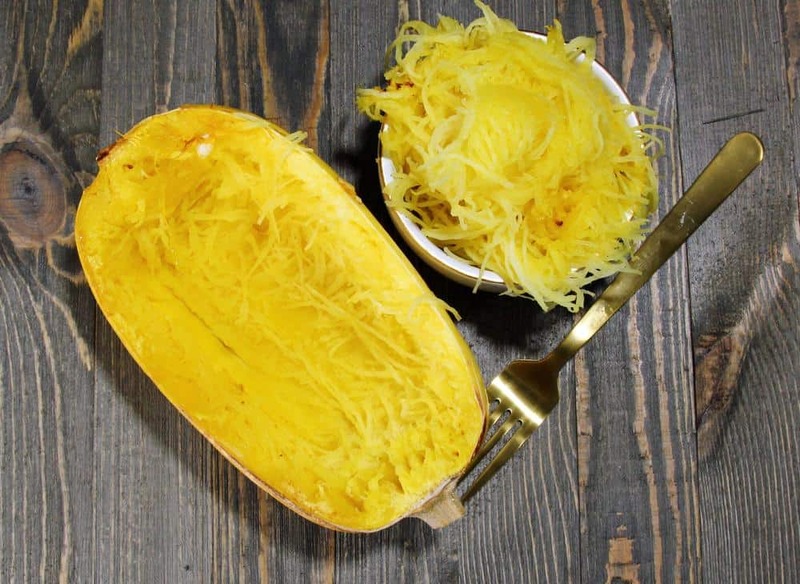 This is probably the most popular way of preparing spaghetti squash. By using this method, the squash develops a delicate flavor, which you can't quite get with the microwave. The downside is that this way requires a lot more time so it might not be optimal when you are in a rush. Here are the steps to follow. Preheat the oven to around 400 °F. Let it heat up while you're prepping the squash. Same as with the microwave method, cut off both ends of the squash, cut it in half lengthwise and scoop out the seeds with a spoon (save them for later if you like). Brush the insides of the squash with about one teaspoon of olive oil and sprinkle with salt and black pepper to taste. Cover a roasting pan with baking sheet and place each half of the squash face down on it. The sheet will help caramelize the surface of the squash thus enhancing the flavor even more. Roast for 35-45 minutes. It all depends on the size of the squash. It is ready when you can pierce the skin with a fork and slide it in easily. Smaller squash will cook faster than a larger one, so make sure to check it after 30 minutes. Return to the oven if needed for another 5-10 minutes and check again. Remove it from the oven when it's done. Leave it to cool for around 10 minutes and then scrape out the spaghetti-like strands from the flesh. This is the slowest and most "laid back" way of cooking squash. It takes time, that's the downside, but in return, it doesn't require much preparation, effort or at tention. Just pop it into the slow cooker and go about your other activities. The end result will be a bit different than the other two methods, but then again quite similar. Give it a try and see how you like it. Here are the instructions. Wash and clean the outside of the squash thoroughly. You don't want any dirt sticking onto the skin during cooking. Using a small knife, poke a few holes into the skin of the squash. This will allow the steam to exit while it is being cooked. Place the squash into the slow cooker and turn it on. 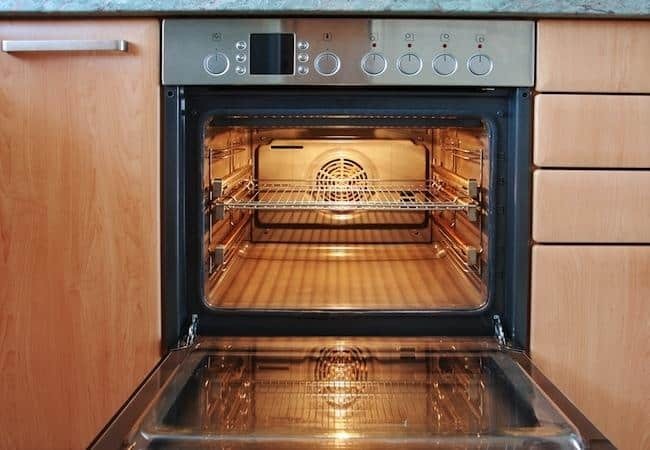 If you set it on high, the cooking time will be around 3 hours, and if you set it on low, it will take around 5 hours. The cooking time will also depend on the size of the squash. Check if the squash is done by pressing your finger into the skin (be careful it is hot, so wrap a towel around your finger). If it dents in easily, it means that it is cooked, but if it's still hard on the outside, it might need a bit more time. Once it is done, take the squash out from the pot and let it cool for a few minutes. After it is cool, split the squash in half along the equator (not lengthwise) and scoop out the seeds. Take a fork and separate the strands from the flesh. 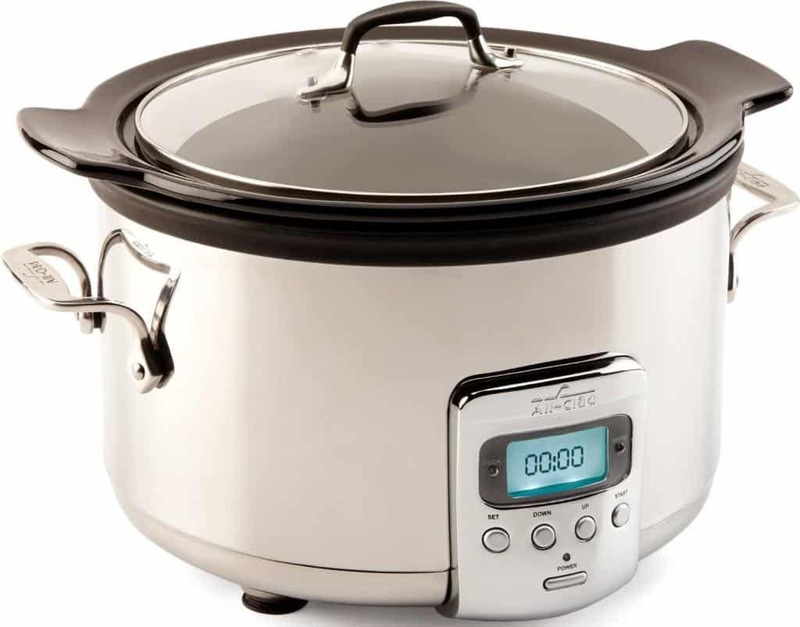 As you've probably noticed, the slow cooker method has a small detail different than others. Yes, you cut the squash horizontally, not lengthwise. Cutting the squash this way makes the threads way longer compared to the lengthwise cut. The squash meat develops threads in this direction naturally, and when you cut it lengthwise, you tear the threads into smaller pieces. 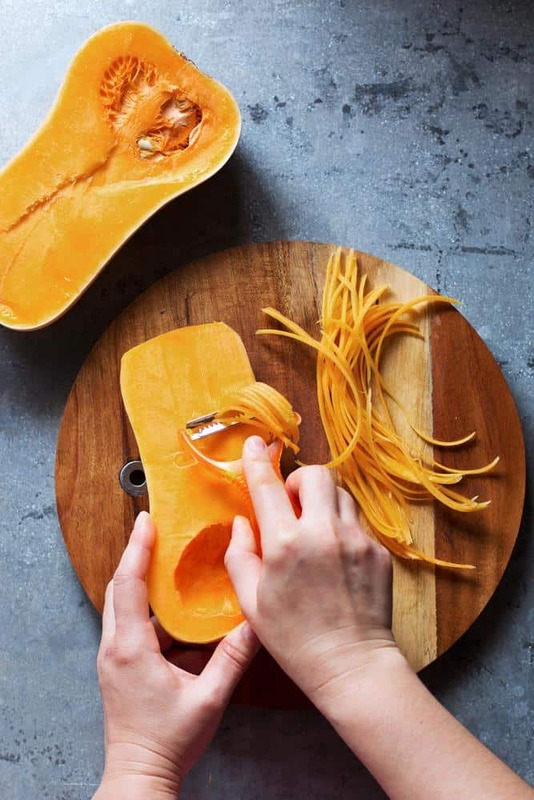 To achieve the perfect, extra-long threads that resemble spaghetti the best, you should cut the squash along the equator to create 1-inch rings. Separating the strands from them will be easy, and you'll have the best possible threads that can be three times longer than ones from the standard cut. 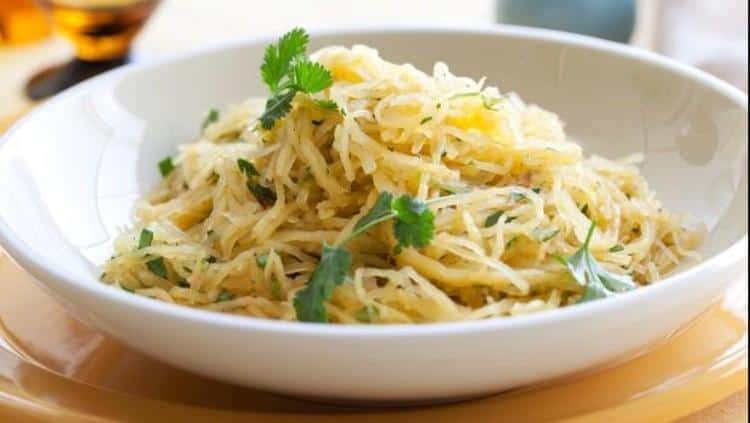 The usual recipe for spaghetti squash requires cutting in half lengthwise for better cooking, but if you process the squash into rings, you'll have them ready at less time, and they will develop the superb spaghetti threads. Using this method provides better results, for a shorter period of time, and gives you the ability to exploit seasoning better because you won't boil the squash for so long, compromising the spices to blend into threads and possibly affect the aroma and taste. Prolonged boiling in water is necessary to achieve the softness and thread development (That's why you wait for the crust to soften). Thanks Beth for this fantastic advice. Bonus: to have a great meal, you can mix the spaghetti squash with the regular ones; they tend to merge extremely well. Besides from being healthier while retaining the taste, combined spaghetti will mix with the sauce you've made very well, and create a unique taste. This way you'll revamp your dish both in taste, structure, and health impact. The best way to become good at something is to learn from the best, so checking out a few tips and tricks from the pro chefs and experienced kitchen enthusiasts could only be a good thing. 1. TheKitchn is a food magazine with daily updates, reaching over 17 million people every month. It is run by a diverse team of writers, editors, recipe developers and photographers. These guys know what are they talking about. Emma, a contributor of TheKitchn, likes to place the halves of the squash face-down in a baking dish and pour in a little water in the pan. After that, she covers it with foil to prevent the steam from escaping, which results in a very tender squash. This applies to the oven method. 2. Epicurious is a wonderland of all food-related things, filled with awesome recipes, expert advice and much more. It spawned a community of passionate contributors, who populate the website with valuable content. This is a tip from Anna Stockwell of Epicurious. Since the squash is quite hard to cut in half, she likes to poke a few holes in it and put it in a microwave for a few minutes. This will soften the squash and make it easier to cut. 3. The Stone Soup is a food blog by Jules who loves simple, healthy and delicious recipes. She believes that cooking and eating are some of the greatest joys in life and does her best to promote them as such. Jules cuts the squash crosswise and removes the seeds. Then she bakes it in an oven cut side up because this results in longer strands, and it also browns the top side making it even more delicious. 4. Kitchen Treaty was founded by Karen, a vegetarian who loves to cook for her omnivore family. Her website contains many healthy, mouthwatering recipes and much, much more. Karen recommends using a sharp and heavy chef's knife when cutting the squash in half because it's so thick and hard. Be careful while doing this. 5. Eating Well Media Group is a communications company with a mission of inspiring and providing people with healthy recipes, and promoting a healthy lifestyle. When shopping for ingredients, Devon O'Brien of EatingWell recommends looking for the most yellow spaghetti squash you can find, free from any soft spots. The yellower the skin, the yellower the insides of the squash will be. 6. Katie is crazy about sweets, and she is also health conscious and on her blog ChocolateCoveredKatie, she shares many terrific recipes tailored to satisfy the soul the body. She likes to cut the spaghetti squash lengthwise and bake it in an oven cut side up. She also bakes it and 460 F, which is quite high, in order to caramelize the natural sugars of the squash and take out all the moisture. 7. CaféDelites is Karina's website and internet kitchen. She loves balanced meals and promotes slim waists as well as delightful flavors. She notes that considering the size of the spaghetti squash is quite important. Medium and smaller squashes will take less time to prepare so be careful not to overcook them because you will end up with mushy flesh. First of all, spaghetti squash is meant to be slightly crispy but not as much to be described as hard or crude. The common culprit is trying to cook spaghetti squash as a whole. They are too thick, and you basically have them raw in the middle (that's where the crudeness comes from). The trick is to cut them in half across the length thus letting the heat go in deeper. There is a way to cook them whole either in an oven or in a microwave. The difference being that when cooking in the oven you don't poke holes whereas microwaving requires holes so that the steam can get out. However, no matter the technique, spaghetti squash will come out thicker and harder if you cook them whole. 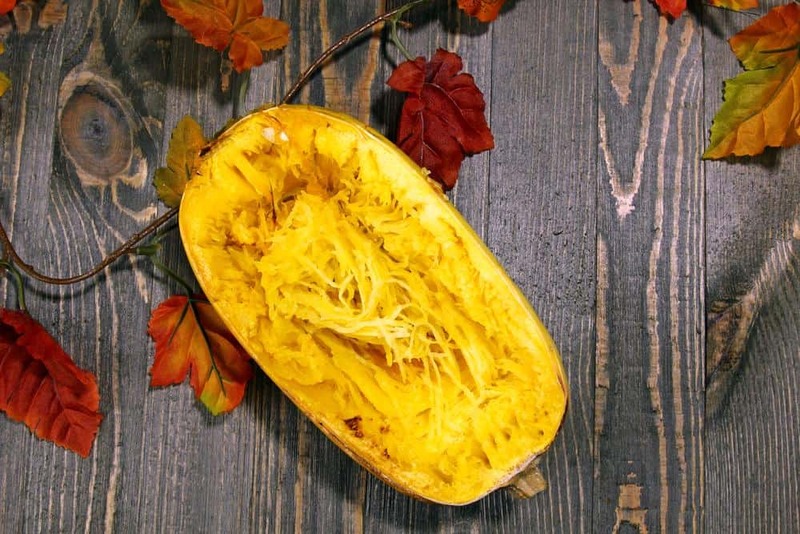 If you have already cooked, shredded and prepared your favorite spaghetti squash but it still feels undercooked there are certain things you can do to fix this. The simplest way to give them a bit more cooking is to microwave them for a minute, give it a bit of a stir, and try them again. Repeat the process if needed. Another way is to steam your spaghetti squash. 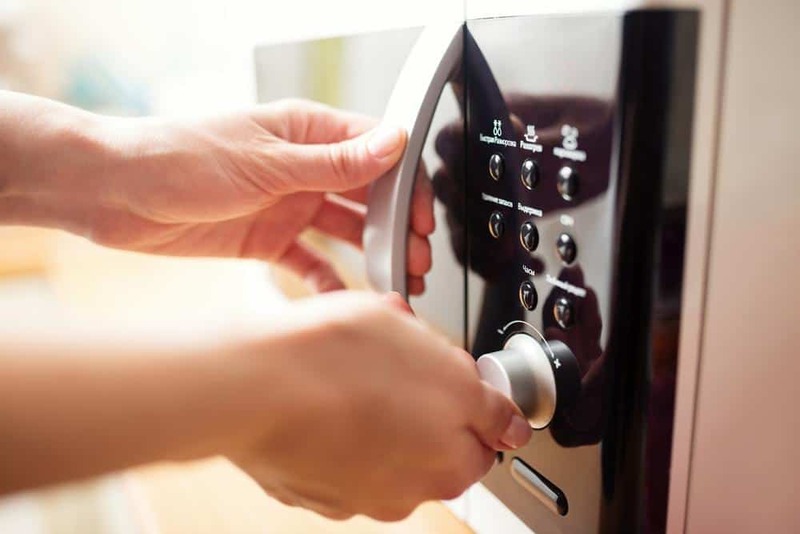 Use paper towels to cover the plate completely and set your microwave to a higher setting (not the highest) for approximately two minutes. Check if it has become soft and repeat the process if it feels necessary. You will notice this problem after you've done cooking spaghetti squash and you try to shred it. You won't be getting the stripes that earned this vegetable the nickname spaghetti, but instead you'll have a mushy mess that will simply spoil the dish. The most probable reason is that when you were cooking spaghetti squash (in a pan, dipped in a bit of water), you had the flesh side facing downwards. This caused the meat to overcook, and you've got yourself a mushy mess. Remember, flesh side up and you shouldn't be having this problem. Spaghetti squash can be tough to cut especially if your knives are not perfect (mainly if you want to cut them lengthwise while it is still raw). Toughness indicates the level of ripeness with tougher ones being a bit green. However, spaghetti squash can be difficult to cut even if it is a perfect specimen. To make the cutting easier, poke a fork through the skin of the spaghetti squash and microwave it for 5 minutes. It should soften it up so you can easily cut it, just be careful as it can be really hot. You can then proceed to cook it any way you wanted in the first place. 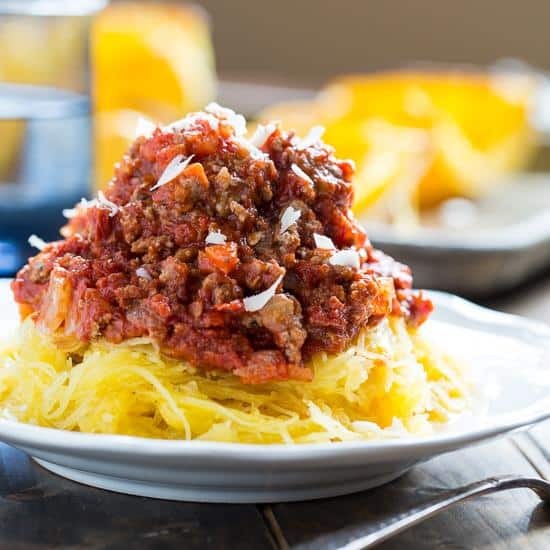 Spaghetti squash is perfectly safe to reheat, and in most recipes, the meal does not lose any of its taste or nutrient value. The safest way is to use a microwave on medium setting. Do not use higher settings as it might start cooking it again and making your spaghetti squash mushy and too soft. Two minutes should be enough on medium settings, but you will, of course, check for yourself. The goal is not to cook it again, but to bring it back to serving temperature so keep that in mind regarding how hot it needs to be. 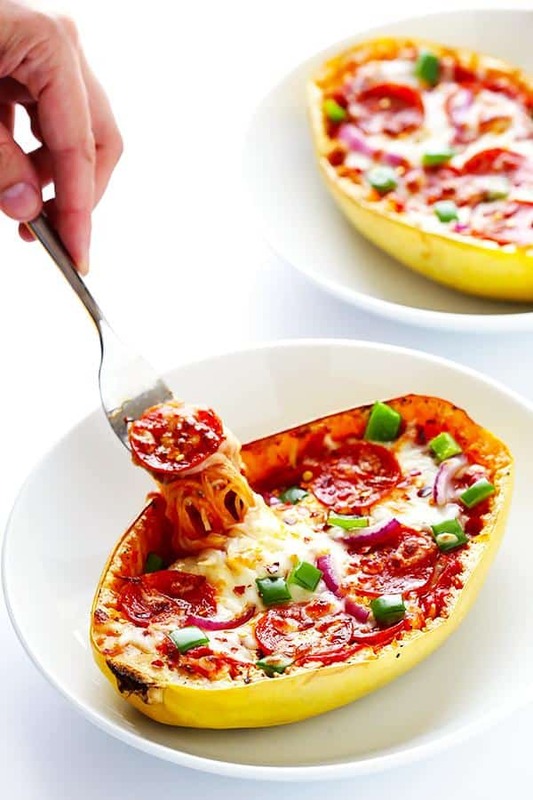 Pizza spaghetti squash boats are a uniquely looking and very fun to make spaghetti squash recipe. Pizza is easily on of the most popular meals in the world, so a spaghetti squash pizza was expectable. It tastes as good as it looks and it doesn't take long to make. It takes about 40 minutes including preparation to have it on your dinner table. Two small spaghetti squash cut in length will make the boats. Olive oil, salt, and pepper are your spices and after it's done baking in the oven pizza sauce and mozzarella are going to give it that pizza look and taste. As far as the toppings go, you can place whatever you like, or whatever you would choose for an ordinary pizza (pepperoni, olives, etc.). 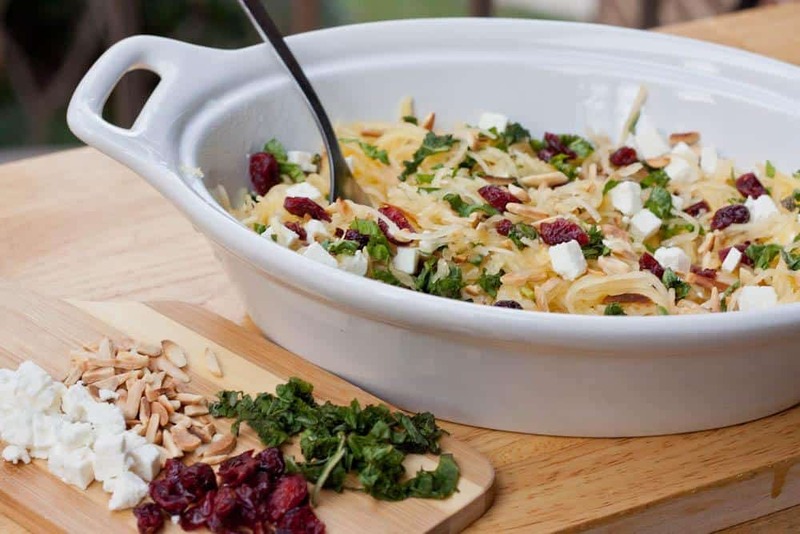 Feta Spaghetti squash is another prime example of how well cheese goes with spaghetti squash. There is another Italian hint in this recipe as garlic and oil being used are the basis for some of the most famous Italian recipes (such as the Alfredo sauce). As with most recipes, you'll need spaghetti squash (seeds removed) cut in half by length baked in the oven. The overwhelming awesome taste comes from comes from a kind of a sauce cooked simultaneously that include onion, garlic, and chopped tomatoes. The finishing touch is made by adding sliced black olives and fresh basil. It takes about 45 minutes to have the meal ready. 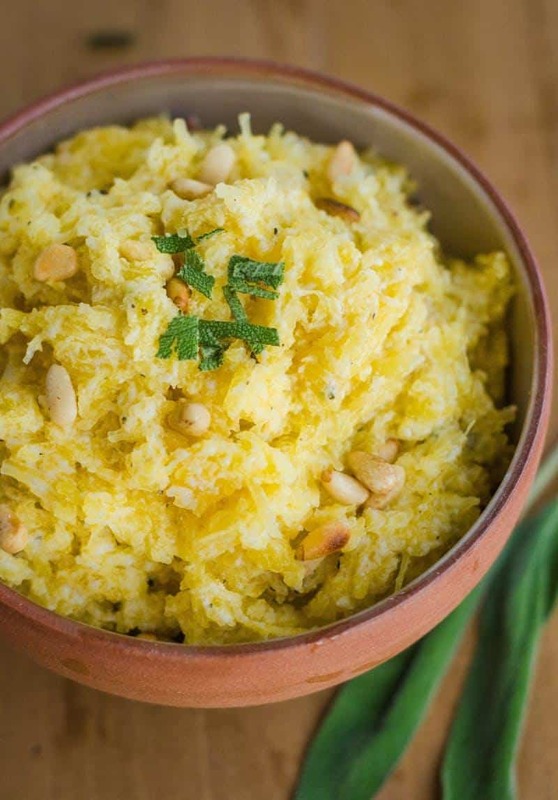 Spaghetti squash salad with pine nuts and tarragon is a top of the line recipe made for those who want to make the most out of spaghetti squash. Chopped Pine nuts and tarragon are fabulously combined with the citrus taste of freshly squeezed lemon juice and finely grated zest of a lemon. White vinegar along with aforementioned lemon products, thyme, and crushed red pepper is mixed in a bowl and covered with olive oil. Just put this mixture over the spaghetti squash and season with salt and pepper according to your taste. 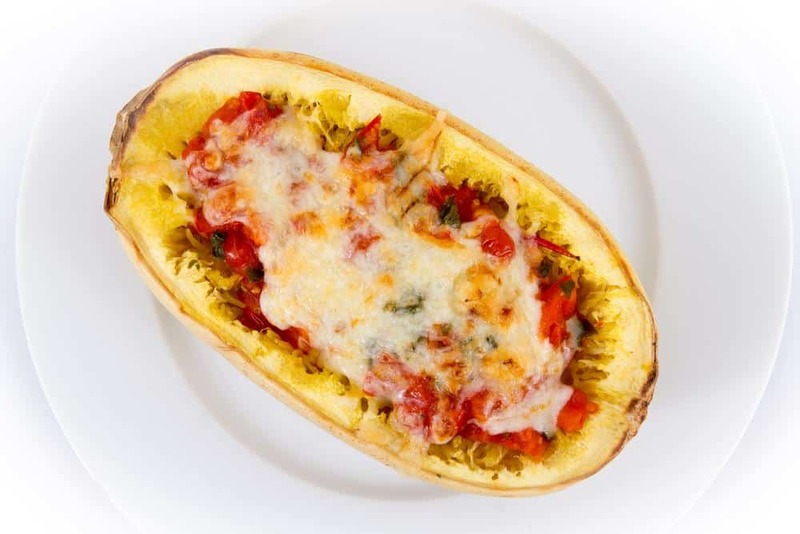 Herbed Spaghetti Squash is an incredibly healthy recipe made by the famous chef Emeril Lagasse. As the name suggests, it is the various herbs that give this dish its special flavor and meaning. It takes a bit longer than usual to cook (around 1h and 5 min) but it more than makes up in a plethora of taste ravaging flavors. Spaghetti squash is prepared the usual way but what happens in the skillet is where the magic comes from. In a heated skillet add butter, spaghetti squash, herbs, salt and pepper and gently toss them until they combine. The herbs should be finely chopped and mixed, and chef Lagasse recommends using basil, chives, chervil, parsley, sage and similar soft herbs. Recipes involving spaghetti squash don't have to be works of art made by master chefs. They do not always require a lot of ingredients or rare spices. 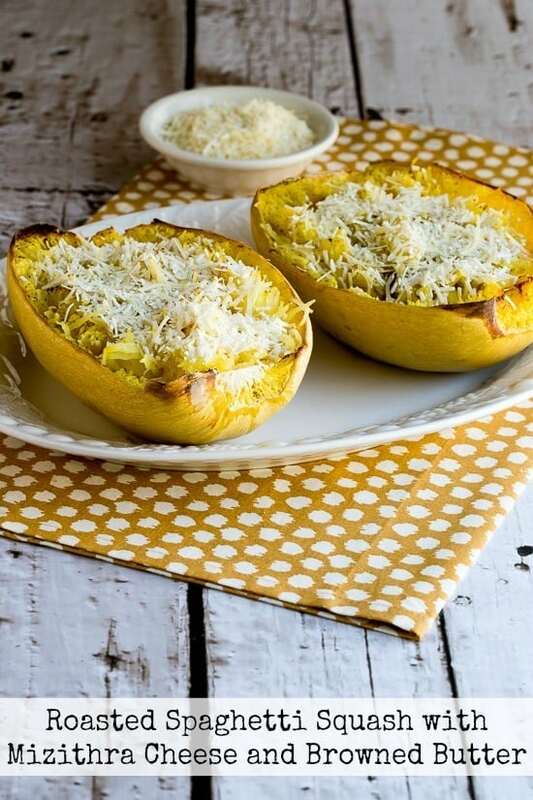 The best example is the Spaghetti squash with Parmesan cheese recipe. Using a tried out technique from mac and cheese this recipe utilizes the dough like qualities of spaghetti squash and imbues them with the lovely flavor of Parmesan. 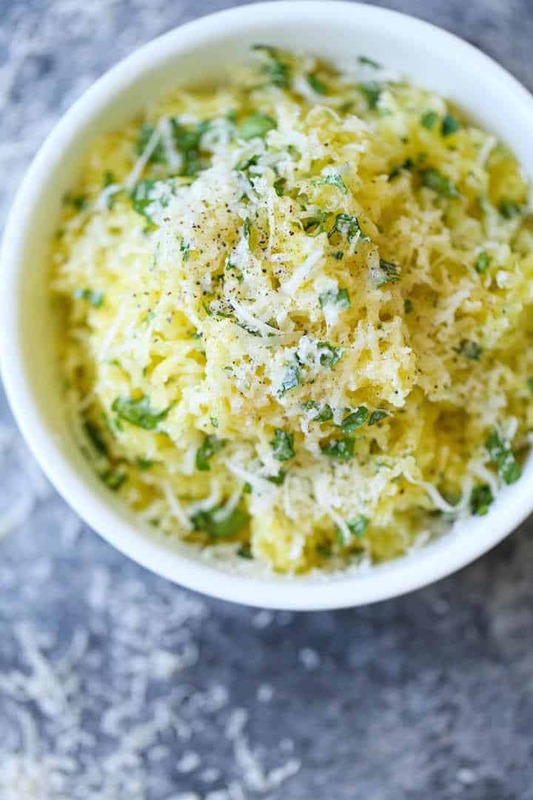 When we exclude the Parmesan and, of course, spaghetti squash, all you need for this recipe is butter, salt, and pepper. This recipe is perfect for novice cooks that have started to enjoy this unusual vegetable. This exquisite and yet simple recipe from The Domestic Blonde food blog is basically a combination of winning ideas. Who wouldn't want a meal made with spaghetti squash, chicken breasts, and cheese? As it turned out, combining these three main ingredients was not as difficult as one might think. This recipe consists of microwaving the squash, but you can always do it the old-fashioned way, inside an oven. Microwaving does shave off a significant amount of time, but it seems as though the oven gives it that special something we all adore. While the squash is cooking, heat another pot and add cream cheese until it has melted. Consequently, add shredded chicken breasts and the Buffalo sauce and once it is done pour it over the spaghetti squash. Sprinkle with cheese (bake some more if you want the cheese to melt), and you are ready to go. Here's an all-natural, vegetable recipe that emphasizes squash with the great combination. Pine nuts and Romano cheese blend with spaghetti squash surprisingly well. Now it's time for you to capitalize on it. You won't need much; the average squash cut in half and baked in the oven until soft, toasted Pine nuts, a bit of butter and fresh sage, and spices. The process is pretty straightforward: you prepare the squash the standard way while toasting Pine nuts in the pan and chopping the fresh sage. When you extract the squash threads with the fork, add all the ingredients and top everything with the Romano cheese. An instant delight! 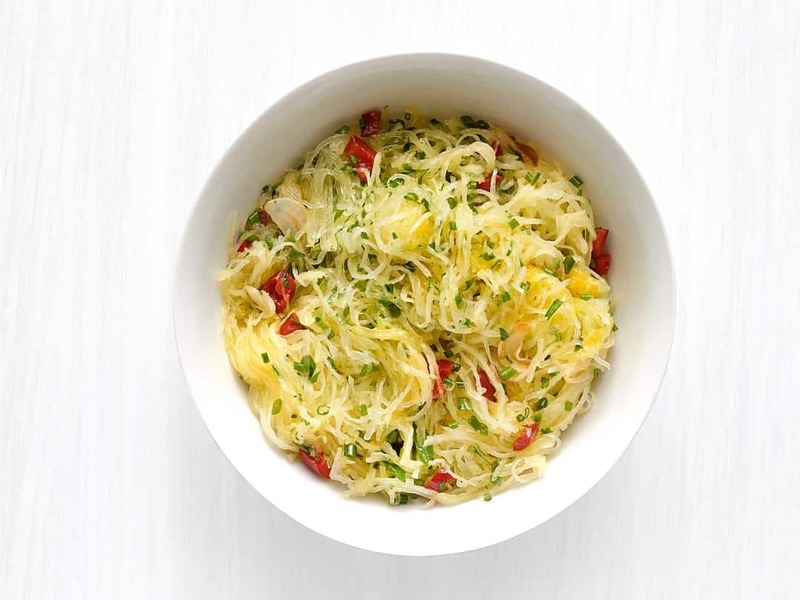 Spicy spaghetti squash is a recipe for people with taste buds and palates prepared for anything. The old stereotype that all veggies have to be bland is effortlessly negated with this top-of-the-line spicy recipe. The spaghetti squash is made in a well-known way, but it is the sauce that makes all of the difference. White turkey meat is cooked in a skillet on garlic, onion, and scallions for 4 minutes and it is joined by crushed tomatoes and red wine. That's something that gives a statement to this dish. Capers, oregano, red pepper flakes and parsley are added before the final simmering for that spicy taste. Serve it hot and enjoy its hotness. Spaghetti squash goes really well with seafood, and this recipe is the perfect example for that. The squash is prepared in the oven at 375 degrees. Length-wise cuts are placed facing down to the bottom of the baking dish, and the surface of the plate is covered in water, for better baking. The process itself lasts for 45 minutes. During that time, a pound of shrimp is prepared in a separate baking dish, covered with salt, pepper, and one tbsp. of oil; roasting lasts for about 8-10 minutes. 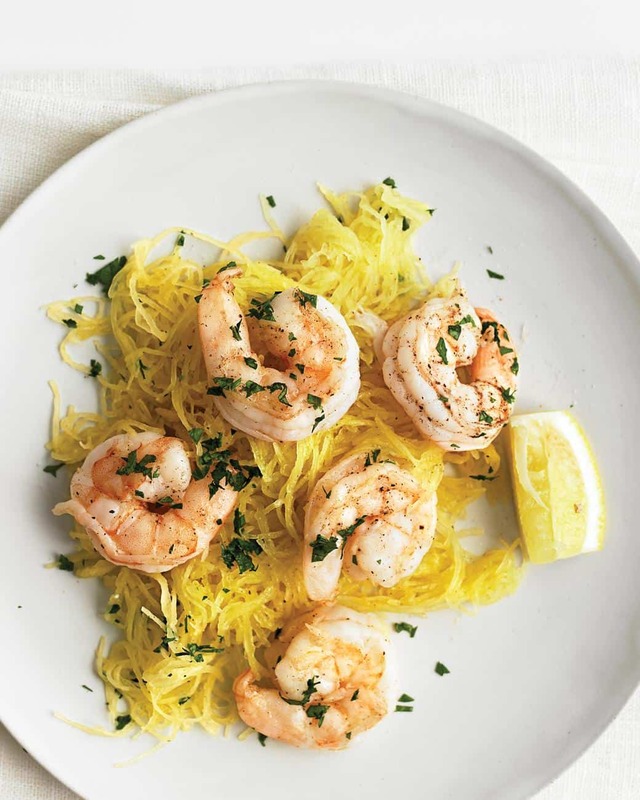 When both squash and shrimp are done, combine them in a bowl with lemon juice, and sprinkle some parsley on top. 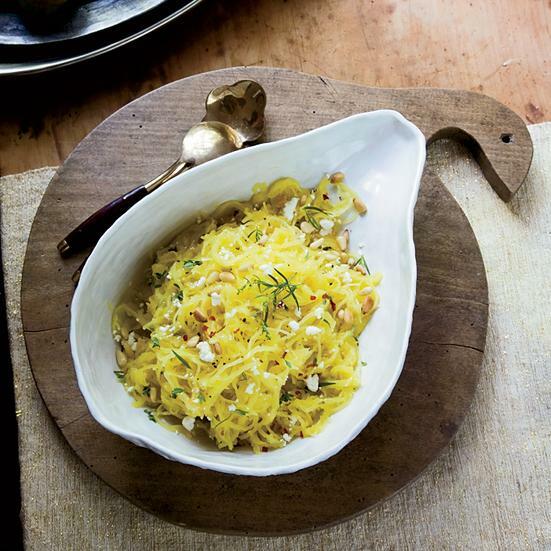 This recipe exploits another unusual combination: spaghetti squash and garlic. Its strong aroma is tamed perfectly with squash's texture and mild taste. This recipe uses a quite simple method to prepare the squash: bake the whole thing without cutting, seasoning, piercing, or anything. Just put it in the oven for an hour or as much as needed to make it soft. Then remove the seeds and start forming the lovely threads. In the meantime, prepare the butter and garlic in a large pan, with the appropriate amount of oil and seasoning to taste (with extra salt). When the garlic starts changing its color, add the squash threads and stir for a couple of minutes. Finalize the recipe with parsley and parmesan cheese. This recipe is the healthy recreation of the old popular recipe from The Old Spaghetti Factory, originating from the early 1969. The Mizithra Cheese is the core of this recipe, because its strong aroma tingles your taste buds the different way. It's quite straightforward, yet so efficient and tasty; if you're vegetarian, you're going to love it! You'll need a standard spaghetti squash, some olive oil, seasoning by taste, brown butter and this splendid cheese. To make this dish, prepare the squash halves and roast them in the oven for 60 minutes at 400F/200C. When they're done, separate the threads with the fork without removing them from the squash and pour melted butter. Garnish the meal with a lot of beautiful MIzithra Cheese and season to taste. Enjoy! There you have it, folks; we've come a long way investigating the marvelous spaghetti squash. It turns out that it is not that hard to prepare it and enjoy its delights. On the other hand, we've explored multiple ways to cook the spaghetti squash, solved common problems, and learned some interesting facts about this gourd. 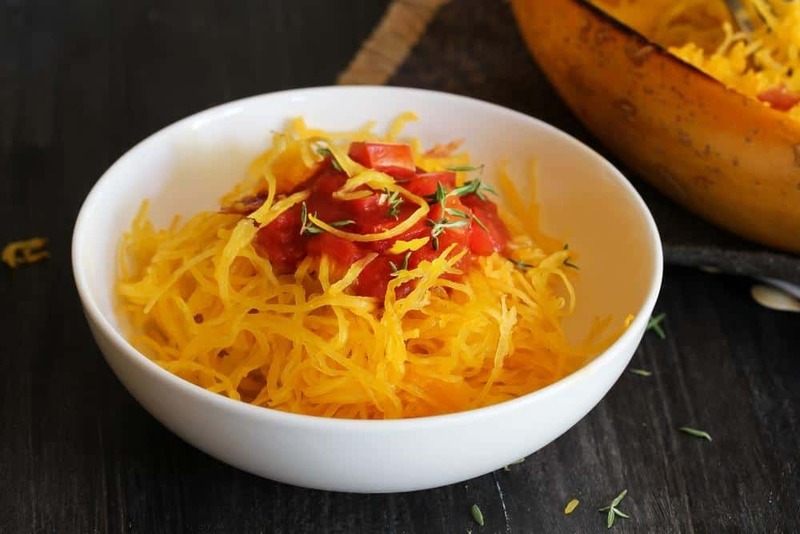 With this guide in your sleeve, you can be sure you'll prepare the best spaghetti squash ever, and replace (or mix with) regular spaghetti with an effective, healthy, and tasty alternative. The enjoyment of eating this food is something we should all celebrate, and so shall you. I wish you many delicious meals. Here are some of the Best Popcorn Kernels we recommend you to check out.